Today we will share with you one of our favourite recipes for a wonderful traditional Polish Dish! 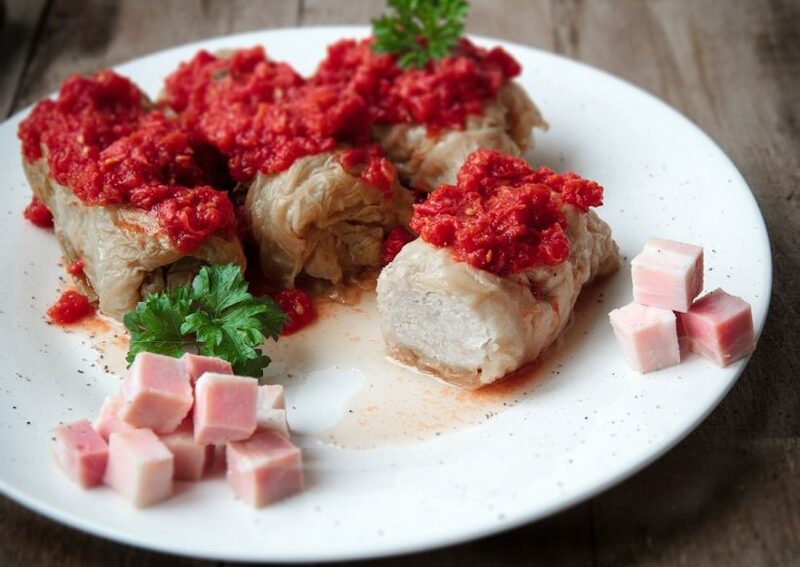 Cabbage Rolls -called “Golabki” in Polish- are a delicious delicacy and a trademark of Polish cuisine. The name “Golabki” means “little pigeons” in Polish, but this meal does not contain any birds: just a lot of bacon! Cook cabbage leaves until they have become soft and translucent. Gently separate one from the other. Cook rice in salted water. In a pan, fry butter with chopped onion until onions are fully cooked. Mix cooked rice, fried onion, minced meat, Sikorski Roasted Bacon or Porchetta, parsley, and garlic together in a large bowl, then season with salt and pepper. Fill each cooked cabbage leaf with a portion of the mixed meat and rice, then wrap/roll the edges of the leaf around the filling like a tortilla wrap. Be sure to tuck in the edges so that no filling escapes. Place the wrapped cabbage rolls into a large pot and add tomato sauce. Cover pot and allow rolls to simmer for 1.5 hours, checking periodically. If necessary, add water to the pot while it cooks so that the sauce does not burn. Remove cabbage rolls from pot and serve with sauce.